It was the second Monday in September when we got the call that our room was ready at the Ronald McDonald House (RMDH) of Dallas. So, we packed up the car and hit the road for what would be our home away from home for an indefinite amount of time. Walking into the RMDH, I was surprised by the beautiful and spacious campus. With over 200 guest bedrooms, the house also includes a family kitchen, a community dining hall, a toddler playroom, a game room for teens, a movie room, a library, a chapel, an exercise room, and several family living rooms spread throughout. Jack quickly made friends, but his favorite was Shiloh, the therapy dog. I’ll never forget the hours spent and memories made playing at the large outdoor playground. There is no doubt, the Ronald McDonald House was and continues to be a huge blessing to our family. Just the same, I resisted immersing myself wholeheartedly into this community. That’s not to say I didn’t meet lots of wonderful people—in fact, I did—but every wonderful family had a difficult story to tell, a story that caused me to ask, “What if that’s Sammy?” All I could think was, I don’t want this life. That Friday, I went in for a 37-week sonogram. Since Jack was staying with us at RMDH, he came too—full of questions about what was happening. But the question ever present on our minds was Sammy’s growth. Being in the 13th percentile the previous month put Sammy much too close to a danger zone for us. Finally, we got the word. “17th percentile!” I heard and eagerly repeated. “No, Ma’am,” the technician corrected, “SEVEN percentile.” We had been previously warned that anything under ten percent would indicate greater risk for Sammy. We were quickly shuffled into another room where we waited once again. Jack played with his dinosaurs while Mike and I traded worrisome glances across the room. Finally, the door opened and we had an answer–actually, it was a question! “How do you feel about having a baby today?” I stared at the doctor puzzled…was this a real question? Given my delay, Mike responded with an enthusiastic “Okay!” The doctor explained the sonogram revealed Sammy was growth-restricted and at risk for stillbirth. Our minds started racing as we knew we had to contact family members to come get Jack—not to mention the plans many had already made for Sammy’s birth in two weeks—or today—or wait…not today? As we mentally scurried to make arrangements, we were caught between two very specialized doctors, each concerned for Sammy, but in different ways. 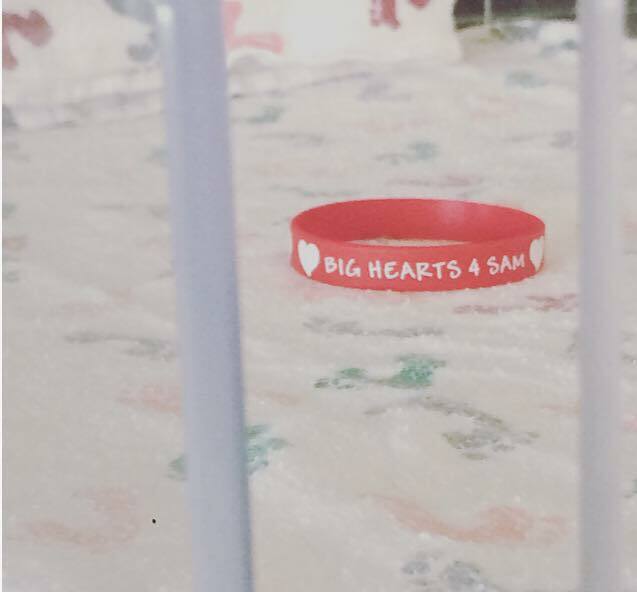 Because Sammy was at risk for stillbirth, our OB wanted to deliver immediately, but his cardiac team insisted that even one more week in utero would improve Sammy’s chances should he need immediate heart surgery—a common occurrence for babies with his diagnosis. Soon a consensus was achieved. I would be admitted to the hospital with bedrest orders for close monitoring. If Sammy suffered acute distress, they could take him quickly, but in the meantime, he was given the gift of time. As I entered the hospital soon after, I was greeted by a nurse. “We’ve been expecting you,” she said cheerily. I smiled back, as that nagging thought resurfaced, I don’t want this life. After being confined to bed for several days, my doctor finally agreed to allow me some time to walk around the hospital. This became a much anticipated routine each day. With a cup of decaf in hand, I would visit the lobby and sit in front of a large wall of windows gazing outside, transfixed and yet allowing my mind to wander. During my visits, I saw the same older man in a hospital gown walk by pushing his IV pole and I wondered about his story. Deep down, did he—like me– not want this life? As the busyness of life continued around me, I would soon reign in my thoughts and focus on the Bible and prayer journal in my lap. It was during this time that God revealed a truth to me that would carry me, moment by moment, through the journey I was about to begin. The Truth is, we aren’t supposed to want this life. As His children, we have a far better promise ahead where sickness, suffering, and dying will have no place, but until that time, we are called to fulfill His purpose—to be His hands and feet here on earth– as sojourners in a foreign land. We have a holy calling, unique to each one according to His will and purpose. What a privilege! Once God revealed this truth to me, I was able to see how surrounded I am by God’s goodness and mercy. Sammy may need heart surgeries and a list of other procedures, but he’s been doing God’s business for some time already. Your cards, notes, emails, texts, calls, and words of blessing are testimony to that fact. This is definitely not the life I envisioned, but we embrace it as a privileged and holy calling. Dacia, thank you for sharing your thoughtful insights as God grows you through this period of your lives together. You are being used by Him to encourage so many people- believers and as yet, non-believers, I’m sure. We are praying for you, Mike, Jack, Samuel and your parents, and will continue to do so. God bless you with His hugs. What a blessing you are, Dacia! Through such challenges you continue to stand firm in your trust of our Mighty LORD. And Believers across the country are encouraged along our Broken Roads, holding tight to HIS Promises because of your powerful witness. Prayers continue to be lifted up daily for Precious Sammy and your whole family.